The Trulife Tri-Leisure Breast Form is foam with a weighted inner suitable for temporary wear during leisure activities. The Tri-Leisure Breast Form has a weighted inner core and the cotton-backed .. The Trulife Tri-Featherweight Breast Form is a made of foam and is ideal for post surgery, leisure and sleeping. Cotton cover is removable for washing. The Tri-Featherweight prosthesis is intended .. The Trulife Harmony Silk Ultima Triangle Breast Form is very soft, natural and lightweight. 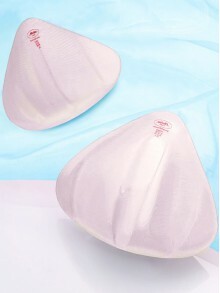 This prosthesis fits most styles of bras and is best suited to medium to fuller cups. Key Features: .. The Trulife Harmony Silk Triangle Plus Breast Form is lightweight and extra soft. This prosthesis is 35% lighter than traditional silicone breast forms. The Harmony Silk Triangle Plus features a si.. The Trulife Harmony Silk Triangle Breast Form is lightweight, natural and soft. 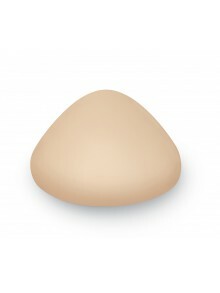 This prosthesis has a versatile triangle shape which works with most bra styles. Best suited for an A or B bra cup. ..
Silima Elegance looks and feels like second nature. This breast form is excellent in underwired bras and most bra styles. Key Features: Re-designed breast form borders Fullness of.. The Anita EquiTex 1057X Breast Form is a multifunctional, lightweight prosthesis with a silicone shell and thin edging. The EquiTex prosthesis has a breathable textile backing made of microfibre, m..